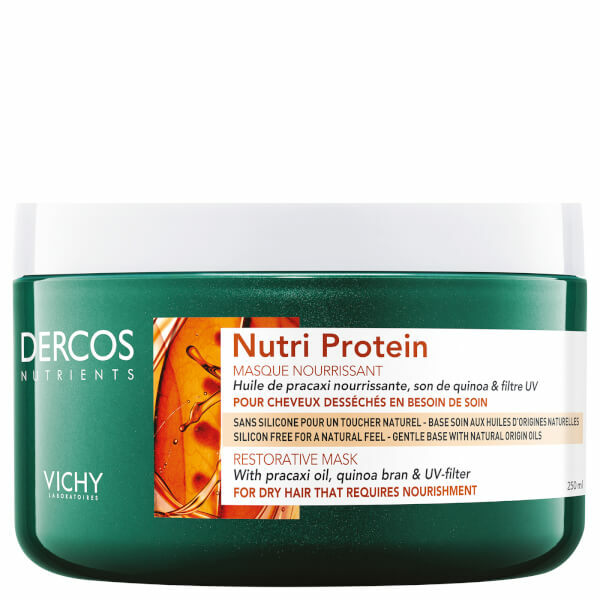 Restore and revitalise dry hair and scalps with Vichy Dercos Nutri Protein Mask, a deeply hydrating hair mask treatment for locks damaged by heat styling and UV rays. Pracaxi Oil and Quinoa Bran work in harmony with Vichy Mineralizing Thermal Water to replenish intense moisture to strands, smoothing the hair cuticle and reducing breakage and split ends. After use, expect silky, supple and healthy-looking results. 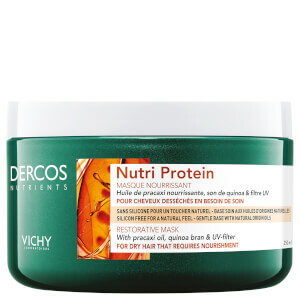 Suitable for dry hair and scalps. Use after shampooing. Apply the mask 2 times per week to towel dried hair. Leave mask on for 15-20 minutes. 1144795 F, Aqua/ Water, Cetearyl Alcohol, Glycine Soja Oil/ Soybean Oil, Behentrimonium Chloride, Benzoic Acid, Benzyl Alcohol, Benzyl Salicylate, Caprylyl Glycol, Chenopodium Quinoa Seed Extract, Ethylhexyl Salicylate, Glutamic Acid, Isopropyl Alcohol, Limonene, Linalool, Pentaclethra Macroloba Seed Oil, Pentaerythrityl Tetra-Di-T-Butyl Hydroxyhydrocinnamate, Phenoxyethanol, Tocopherol, Parfum/ Fragrance.